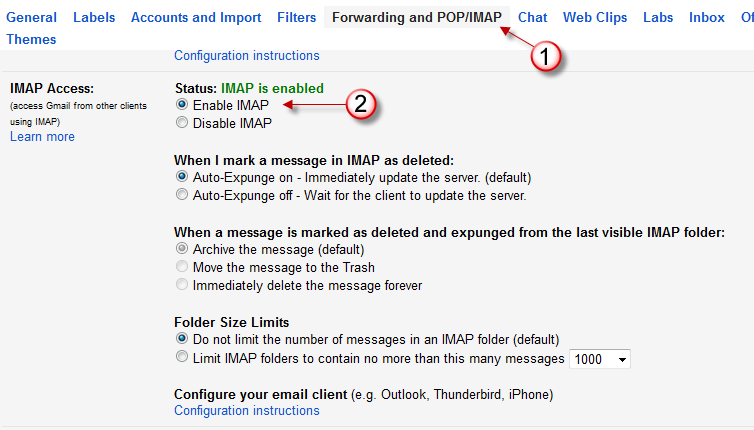 This guide explains the steps involved in setting up IMAP in Gmail. IMAP stands for Internet Message Access Protocol. Like POP (Post Office Protocol) IMAP is the standard protocol used for email retrieval. Google has enabled IMAP as well as POP for all Gmail users. However, you may need to setup IMAP in your Gmail account by enabling it prior to start using it. Here is how you setup IMAP in Gmail. On the right corner you will find a Gears icon. Click on it to open a drop down list. From the drop down list, click on the Settings menu (as shown in image below). You will be taken to the Gmail settings page. Here click on the "Forwarding and POP/IMAP" menu link. This will take you to the page where you can enable IMAP for your Gmail account. 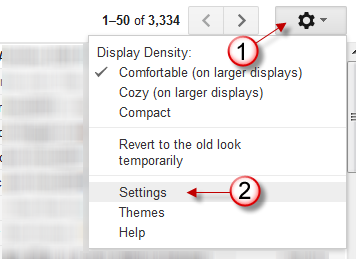 After you have enabled IMAP in Gmail, commit the changes by clicking on the Save button. Lastly you should configure your mail clients and mobile devices to start receiving and managing your email from Gmail using IMAP. You can find a list of mail clients and mobile devices that you can synchronize with your Gmail here. There are a couple of things you need to know when using IMAP for retrieving your email. 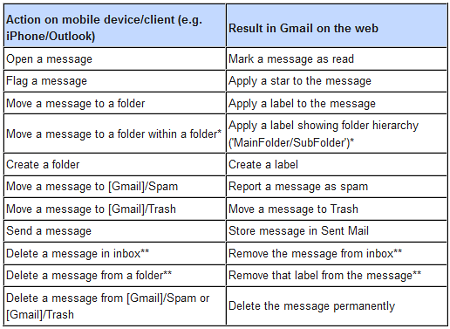 The following table lists what you can expect when you take certain actions in your email client/ mobile device if you decide to use IMAP.